See it. Read it. Do it. For those of you that know me, you know that I am no where near "basic" and it is kind of ironic that I am writing post about the importance of being basic. But, I have to remind myself that being basic is okay and has its advantages. Look at your surroundings... What do you see? Who do you see? What surrounds you? Who surrounds you? Are you surrounded with hype? Are you surrounded with unnecessary stuff? Are you surrounded with frills or gadgets and gismos? Are you surrounded with extras? "Mrs. Chenault! Check this out!" "Can I show the class?" Walking in to another concert... I had the expectation of worshiping a great and almighty God, but nothing more... 5 minutes into a Q and A with the artists I knew this concert was not going to be an ordinary concert. In a world being taken over by politics and opinions, I thought I might as well just throw my two cents in! For or Against?It crazy for me to sit here and deny that I have always felt one way or the other... because I have been on a teeter-totter! Well, I have finally made up my mind! I am going to be jumping for joy and so are the kids! Many of the students are on the bus for over an hour! I couldn't sit that long! And I was ready for fresh air after an hour!Many of the students outlooks are survival. They are not worried about anything other than meeting their families needs and their needs. Work Hard AND Play. A Look at Small Groups. I am thrilled to be able to reveal to you a GENIUS small group idea that integrates student choice, students being challenged, student interests, AND GOOGLE APPS FOR EDUCATION! The majority of us conduct small groups in reading and math... How would you like to NOT be in a rotation and to be able to coach, mentor, and monitor students learning? If so, read on! Part 1: HyperDocs Change EVERYTHING Last year, I began implementing hyperdocs in my classroom. I didn't know at the time that they were hyperdocs... However, they are a game changer... 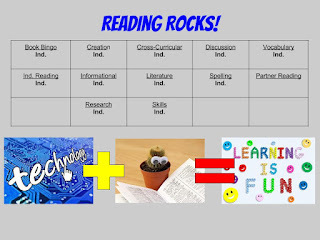 Check out my math and reading stations below. Of course you can use a variation of this, as it is heavy on digital use. To interact with the stations, click on the links! Featuring Thomas Nelson High School in Bardstown, KY.
Thomas Nelson will begin its fifth year as a school for the 2016-17 school year. The administration and staff has worked extremely hard to create a culture of CARE. They have based their culture on the popular book, written by Seth Godin, The Purple Cow. In his book, he discusses standing out from all other cows and to create remarkable products that are risky and people seek out. They also have embraced the "Yes" mentality, Fly Closer to the Sun, and Fly and Defy. Wes Bradley, the principal at Thomas Nelson High School, brought up the difference between the two terms, rebel vs. rebellion, and I couldn’t agree more from the perspective of an administrator.